Since the past couple of days, there has been news circulating on social media that the Saudi Authorities had organized a grand wedding ceremony for inmates in the prison. While most people thought that it wasn’t true and kept denying, it seems as if the news is true and such has happened. No one can imagine a marriage in prison. I mean, when the word jail or prison is called out, all you imagine is darkness, bars, unhealthy environment, bad food, and smell. You would rather have an image where a prisoner is being treated badly by the police than being getting married and being greeted on his marriage by the police! I mean, it’s so funny to build a scenario in mind where a policeman is greeting the prisoner over his marriage! However, this is Saudi Arabia where the most unpredictable can take place. A few days back, a couple was allowed to get married and the Saudi authorities hosted their wedding with all zeal and zest. The top officials of the Kingdom’s state security happened to organize the wedding on the weekend for an inmate in the prison. The social media is bursting with this news and people are sharing it with different reactions. While many could not believe what they saw on the internet, there were many who praised the authorities for their kind actions while others reflected their humor. One of the social media users reflected how our Saudi authorities take notice of all small details. They haven’t used the word prisoner for the groom rather have called him the inmate. 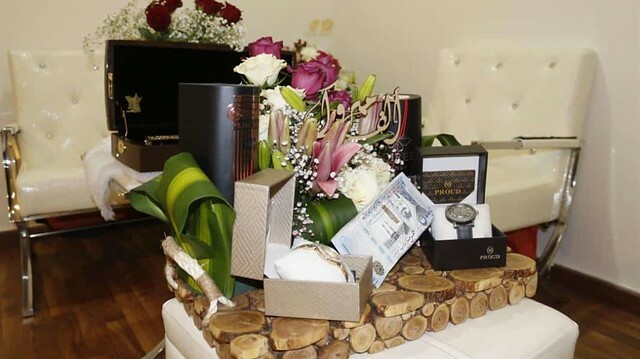 People were also surprised by the fact that the newlywed was presented with luxury gifts. People congratulated the newlyweds and poured prayers for them. Some people said that they want to go to jail so that a five-star wedding be hosted for them. People also claimed that they now believe that Saudi Arabia is equipped with 5-star prisons. This is however not the first time that the authorities have arranged marriage at the prison. This is indeed the third time. The first one was also conducted in the Eastern province jail last year where a national charged over drug use in 2017 who was serving his 4 years of sentence happened to get the approval of his marriage and married his fiancé. In 2015, Kevin Sullivan wrote for the Washington Post after visiting the al-Hayer prison that the inmates were allowed to spend private time with their wives and were served with tea and snacks.